As far as pest problems go, there is nothing worse than a stressful and destructive termite infestation. These little insects gnaw away at the supports to your home, potentially costing thousands of dollars in repairs and structural damage. Luckily, with this list of home remedies for termites, you will be able to help stop a termite infestation. There are three types of termites: dampwood termites, drywood termites, and subterranean termites. However, as a homeowner, you are most likely going to deal with drywood termites and subterranean termites. Start your pest control plan at the first signs of a termite infestation. The two termite species behave differently, so knowing which type of pest you have will make your termite treatment plan more effective. 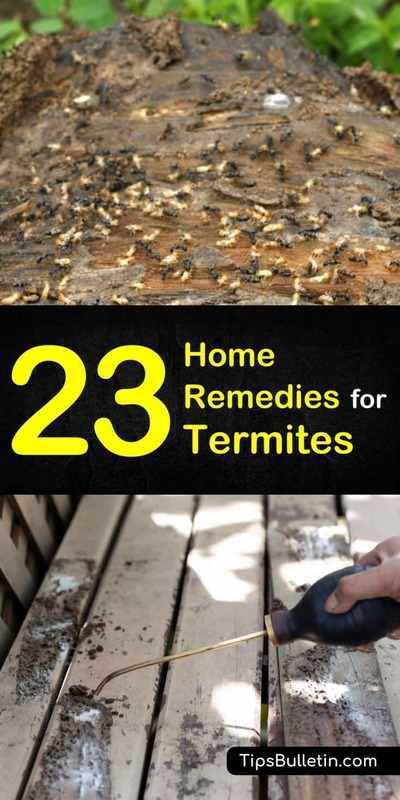 Whether you are looking for some simple home remedies for termites or looking for a homemade termite killer, this master list will serve as an excellent guide for how to get rid of and help solve your termite problem. If you either want to stop a problem before even has the chance to start, or you begin to notice the very early signs of a termite problem such as buckling wooden floors or small holes in your drywall, you can start by looking at your yard. If you have any old tree stumps, call someone to remove them. Old tree stumps serve as great breeding grounds and hiding places for termites, and before you know it, there’s an entire termite colony in your backyard. Everybody wants to have a beautiful lawn. However, wooden mulch and wood chips, some of the most popular landscaping materials, should be avoided. The wooden mulch serves as a breeding ground for termites which will eventually result in a termite problem. Instead, consider laying your landscape with rocks and pebbles. This change will also minimize weed growth. If you know you are dealing with subterranean termites, then this easy solution is perfect, especially if the colony is under your yard. Subterranean termites travel through mud tubes that they construct underground. These tubes can connect the entire colony to your home. By turning on your hose and saturating the soil, water will seep into their mud tubes and collapse them. Flooding is not only an easy natural termite killer, but it will also destroy their tunnels and force any surviving termites to relocate. Thanks to the active ingredient d-limonene, termites and many other pests find orange oil intolerable. Orange oil serves as one of the purest natural treatments against pest infestations of all kinds because it is toxic to many common pests, including bed bugs. Orange oil is an excellent solution if you know the termite infestation is only in a particular area. Wipe a few drops of orange oil over the infected location, and the termites will be driven out or killed if they come into direct contact with it. This natural termite killer is helpful with drywood termites (..). There are many benefits of neem oil, so it’s no surprise that it joins this list of home remedies for termites! Similar to orange oil, neem oil is toxic to many pests, termites and bed bugs included. To use this natural termite killer, cover the infested area with neem oil in such a way that will encourage the termites to eat it. Otherwise, it will not kill them. Whether you want to coat the infected area in neem oil or inject it into the wood structures, it may take several applications before it starts to kill termites. A rather simple homemade termite killer is clove oil. You can follow this recipe for an effective, natural method to kill termites. Just add the drops of clove oil into a spray bottle and then fill with the water. Give the spray bottle a swish to thoroughly mix the ingredients. Then, spray the infested areas. This clove oil spray will also help with carpenter ants! Another one of the easier home remedies for termites is garlic oil. You can follow this simple recipe to help when you start to notice termite activity. Add the garlic oil, and neem oil if using, to a spray bottle. Pour in the water and give the spray bottle a little swish to mix the ingredients. Then, spray the suspected infested areas with the garlic oil at the first signs of termites. This will also work with carpenter ants! If you want to gauge just how large a termite infestation you have, take an old cardboard box and dampen it with some water. The cellulose in the cardboard will create a woodsy smell once the cardboard becomes wet. This scent will act as termite bait and attract the insects. Place the damp cardboard box in strategic areas near the wooden structures in or around your home and the termites will be drawn to it. Once you notice termites in and on the box, destroy it. This traditional pest control remedy also serves as an excellent termite control solution. By sprinkling the diatomaceous earth in strategic areas throughout your home near suspected infestation sites, you can begin working against your infestation. The diatomaceous earth will dehydrate the outer layers of the termite and eventually crack their skin and kill them. Continue to re-apply this natural termite killer until you no longer see termites. Often used as a pest control solution, boric acid or Borax can also be used to help manage your termite problem. Insects have very adverse reactions to boric acid. When an insect comes into contact with boric acid, their nervous system becomes affected and compromised, thus killing them quickly. You will need to continue to re-apply the boric acid until you no longer see any termites in your home. Chances are you have a bottle of white vinegar in your pantry or mixed among your cleaning supplies. You can follow this straightforward recipe to create a practical solution to help control termites. Mix the ingredients in a spray bottle. Give the spray bottle a swirl to thoroughly mix the ingredients. You can then spray the mixture on the suspected affected areas. Similar to orange oil, the lemon juice will also act as a deterrent. You can also soak cotton balls in the mixture of this homemade termite killer and place them in strategic areas to help prevent a termite infestation. Another natural spray you will likely already have the ingredients for is this soapy water spray. Follow this simple recipe. Mix the two ingredients in a spray bottle and give the solution a little shake. Then, spray your homemade termite killer on the affected area. The soap will coat the termites, making it near impossible for them to breathe so that they will suffocate. You may need to re-apply the spray a few times to make sure you kill all the termites. If you are looking at a small infested area, you can use the aloe vera gel that comes from the aloe vera plant. Just take small sections of the leaves and crush them into a paste. Apply the aloe vera to the infested area. As the termites travel through the aloe vera, they will be coated and will suffocate, making it one of the more natural home remedies for termites. If you don’t have access to aloe vera, you can use petroleum jelly. Not only will petroleum jelly have the same suffocating effect as the aloe vera, but phenol is one of the ingredients. Phenol has often been used as an insect repellent in the past and works to drive away insects. For the termites that might not travel through the petroleum jelly, they will be forced away thanks to the phenol (..). By creating a canola oil trap, you will have a sufficient natural termite killer that you won’t have to worry too much about after setting it up. Wipe a small amount of canola oil across the infected area. Once a termite travels through the canola oil, it will suffocate because the oil will coat its outer shell, making respiration impossible. Salt, another household staple you already have, can also serve as a smooth, natural termite killer. Make a mixture of salty water in a spray bottle and spray this homemade termite killer where you see termites. The salt will dehydrate the termites and will eventually kill them. Another natural termite killer that is easy to distribute is parasitic nematodes. Certain parasitic nematodes will feast on small insects, such as termites and carpenter ants. By releasing these nematodes throughout your yard, you can combat a subterranean termite problem. Another natural termite killer designed to target subterranean termites is the Beauveria bassiana. This soil fungus acts as a natural insect deterrent. For those individual termites who aren’t scared away by the fungus itself, the fungus infects the termites slowly eats and kill them. Beauveria is another solution you can set and forget. If you suspect that your infestation may be limited to some wooden furniture or a particular item, the first step is to move the furniture outside. The heat that will build up due to the sunlight and will force the termites out of the item. Once the termites are outside, the sunlight will quickly dry them out and kill them. A rather extreme measure you can take is to seal the infested areas and perform a heat treatment. Take hot air and force it through the infested space. By raising the temperature to at least 120 degrees, and sustaining that temperature for at least 35 minutes, you can kill the termites relatively quickly. The opposite of heat treatment, you can instead use a cold treatment. However, this process will take considerably longer. Similarly, once the infested area is sealed, you can lower the temperature. By dropping the temperature to 15 degrees and sustaining that temperature for at least four days, you can kill or drive out the termites. If you are beginning new construction on a home, you can install termite barriers as a preventative measure against subterranean termites. Typically made of metal, termites are not able to chew through this material. As a result, any termites in your lawn are forced to move elsewhere. Another added benefit, you may see the tell-tale mud tubes along the sides of your home, and then you can deal with the termites when they’re still in your yard. When all else fails, or if the infestation is much more massive than you imagined, you may need to call a pest control company. They will handle all of the challenging work, such as inspecting crawl spaces and attics and be able to pinpoint not only where the entire colony is, but even identify which of termite species you are dealing with in your home. With a team of pest control professionals, you will soon have your home termite free. 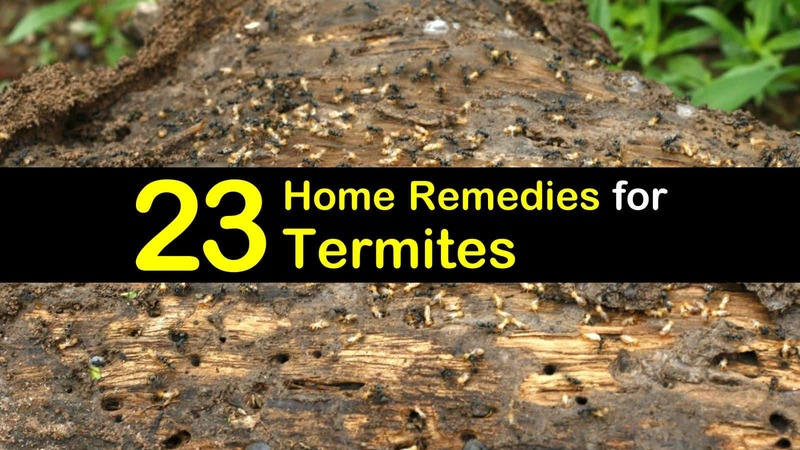 Hopefully, this master list of home remedies for termites has given you a few ideas on how to handle your termite infestation. With these various tips and tricks, you can help slow down or put a stop to any other insect problem you might have. If you have any friends or family who could benefit from these homemade termite killers, please share these pest control tips on Facebook or Pinterest!